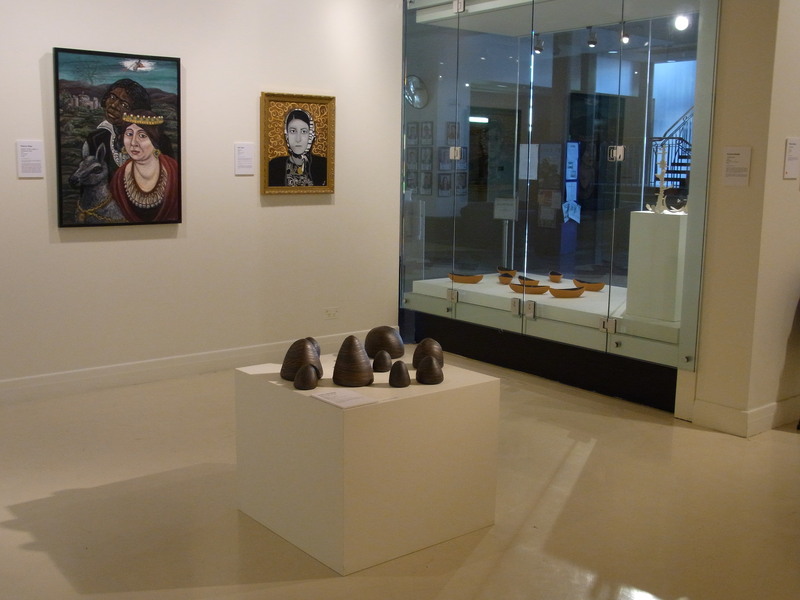 Place and Belonging was the theme of the 2010 contemporary art exhibition – The Women’s Salon – in the Counihan Gallery Brunswick. I presented a group of 12 pieces: Nurturing Lands. Our land resonates with stories. It nurtures us. My ceramics reflect my response to both stories and place. We tell stories to help us understand. Pots are like stories and by shaping them helps me speak. Does the land create the story – or the stories create the land? I work in clay – and my training is as a potter. I graduated from the Canberra School of Art in 2008. I have worked in clay for about 10 years. This piece is about the land – and its nurturing qualities. I’ll talk about this piece more in a minute. My artwork is about place and connections to place – about how we connect and what connects us. For me, making this work is about try to understand the deep connection and disconnections I feel to the land of Australia – here in Brunswick and elsewhere. When we live in the city, we hardly connect to the land. Here in Brunswick we stand on clay – on ancient soils – Brunswick has been a place where clay has been used for making bricks and pottery for more than 150s years. Or we stand on recent lava flows that covered the western plains – the edge is visible on the Merri Creek. So I want to connect to the land – the very ground beneath our feet – so working in clay is a good medium! But more than that I want to connect to the meanings that a place might have – for me and for others. The genesis of the work here came from time spent time in Central Australia in 2007 in the studios at Araleun in Alice Springs. There I became intensely aware of the many different meanings and stories that are contained in ‘the land’ and of the enormous time depth that could be seen in the land and in some stories. So these pieces have an inside – an unseen interior – they are not solid – they are closed forms. What is inside? What stories are hidden? And these lines on the outside – perhaps they are a little of what is inside seeping out? Perhaps they indicate layers of time or layers of rock or layers of meaning. The forms are nurturing – for me the form is breast-like. But as well they are landforms – and the land actually gives us everything we have. When I make them – they are thrown on a wheel – I deliberately change their form slightly – I stroke them, push and pull them. I want them to gain a sense of life – but still retain great stillness. And the surface? It is terra sigillata – ‘sealed earth’ – the finest clay particles are painted onto the surface before firing. They have a natural shine. The two colours – terracotta/ochre is the natural clay colour – the black has the addition of a mix of oxides. In terms of the grouping? This piece was assembled out of many pieces that I made over a couple of weeks. As the pieces dry, I assemble them in groups. This grouping is about caring for the group – looking after each other – and is the first time I have assembled a group in this way – where there is a clear sense of guarding and a safe centre. It is an expression of something I am trying to achieve in a group that I am part of. Last – for me, making these works is a way of deepening my relationship to land and place – and connecting to my own inner meanings and spaces.